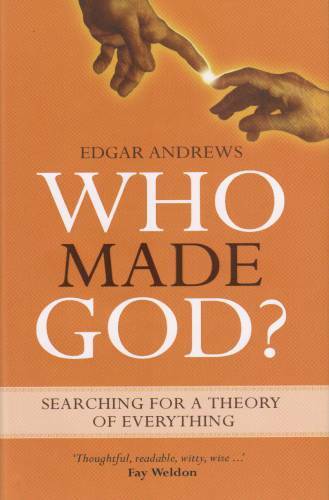 Book Review: “Who Made God?” by Edgar Andrews | J.W. Wartick -"Always Have a Reason"
Thanks for pointing out that rather obvious error in my thinking. I’ll edit the post as needed! Excellent review. I have the book and agree. Sigh, people are stuck up on this stuff. First, we can always ask “Who, or what, created God” or “who, or what, created the universe.” We could go either way with both of these things. This just points out the infinite regress problem. Second, we can always say “God wasn’t created by anything else” or “The Universe wasn’t created by anything else”. This just means we take it for granted without argument. Third, we could always argue in a circle. This is known as the Agrippa Trilemma. And this idea about science, which Victor Steinger might bring up, is just sad. Every theory in science relies on something that isn’t testable itself. It is only when you add on other theories in conjunction with the theory that you propose that you can test a theory. Pierre Duhem pointed this out. So Steinger’s arguments are very weak in themselves and he doesn’t clean his own house while he complains about other’s house. And only people who hold to the stance of realism in philosophy of science care about these arguments between atheists and theists with scientific theories and data. An anti-realist finds none of these arguments convincing or of much weight to support either position. And science describes how the world *could* be, not how the world actually is, unless you talk about the actual observations by the experimentalist. That’s the reality, and the theories you apply to experiments can all be accounted with an infinity of different theories. Regarding your first point, you make an equivocation many people do: namely, assume that the cases of the universe and God are analogous. But why think the universe has any reason of itself, for being uncreated? I merely ask for evidence for that claim. Regarding causation: I have made it a policy to largely ignore arguments against causation. Why? Because anyone who makes such arguments does believe in causation. Anti-realism is itself a position which needs to be justified. Just throwing it out there as a possibility doesn’t really do much philosophical work. My first point made no equivocation, except doing what most people take as a starting point. God is a thing and the universe is a thing. If one doesn’t hold to the universe being a thing, then the Universe was never created. In fact, Bertrand Russell brought up that he doesn’t think the universe is a thing, so the universe doesn’t need any explanation for being created or coming into existence. That is because the universe isn’t a thing where that question even makes senses. The Universe, under what he stated, which was actually part of a BBC debate he had with a theologian, was that the universe is what we call a collection of all the particulars. In other words, only particulars exist and the term “The Universe” is what we call the collection of all particulars. This just raises the question of what created the particulars (Descartes, Malenbranch, Berkeley, and Al-Gazali are all consistent with this view, or what created the particulars). And this reason of itself relies on some antiquated idea that the universe has to be governed by some reason. Talk about lack of evidence, my goodness there seems to be no reason for things in the world. That point makes absolutely no sense, i.e. anyone who makes such an argument against causation does believe in causation. That’s like saying, anyone who argues against X believes in X. Do you believe in Zeus because you make arguments against Zeus? I don’t think so. And you’ve made the mistake of taking a psychological belief on the same par as an epistemological belief/knowledge or logical. People can have psychological beliefs in all sort of things that doesn’t mean it exists just because they believe in it. Oh, and anti-realism doesn’t need too much justification, because I can throw much doubt on justification itself. Ever hear of the Five Modes? That throws serious questions upon justification itself. Sextus Empiricus, “Outlines of Pyrrhonism”. And hey, if you want to be a scientific realist, then you have to hold that causality doesn’t exist, if you believe the theory that is the best tested theory in scientific history (i.e. Quantum Mechanics), and it being the “ground of reality” in the scientific world view, or the realist world view. This isn’t complicated…I figured this out when I was 10. If “time” is a created thing (or, something that “begins”) then, those outside of time are not subject to it. No time, no beginning, no middle, no end. Makes for lousy novel writing…but great for creating universes.